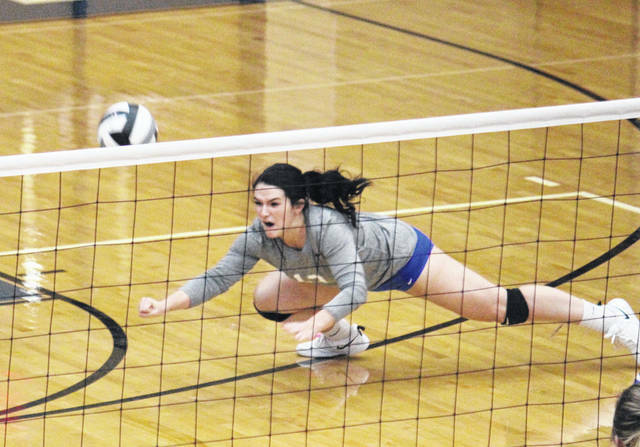 Gallia Academy senior Taylor Burnette dives for a dig, during the Blue Angels’ sectional title victory on Saturday in Centenary, Ohio. Gallia Academy senior Aubrey Unroe (28) sends a Waverly spike attempt back the other way, during the Blue Angels’ straight games victory on Saturday in Centenary, Ohio. CENTENARY, Ohio — A forceful four-peat. The Gallia Academy volleyball team earned its fourth consecutive Division II sectional title on Saturday in its home gymnasium, as the second-seeded Blue Angels rolled to a straight games victory over third-seeded Waverly, claiming each of the three games by double digits. Gallia Academy (21-3) never trailed in the opening game, fighting through just one tie at 3-3. The Blue Angels had a match-high 13 kills to go with a side-out percentage of 80 in the opening set, rolling to a 25-10 triumph. Waverly (19-5) led for the first time at 1-0 in the second set. GAHS tied the game at one and four, before taking the advantage at 5-4. The Lady Tigers tied it at five, but never regained the edge. With a dozen kills and a match-high five aces, the Blue Angels took the second game by a 25-14 count, moving ahead 2-0 in the match. The Blue and White led wire-to-wire in the third set, scoring the first three points and eight of the first 10. Gallia Academy’s highest serve percentage of the match came in the final game, leading the Blue Angels to the 25-13 championship-clinching victory. 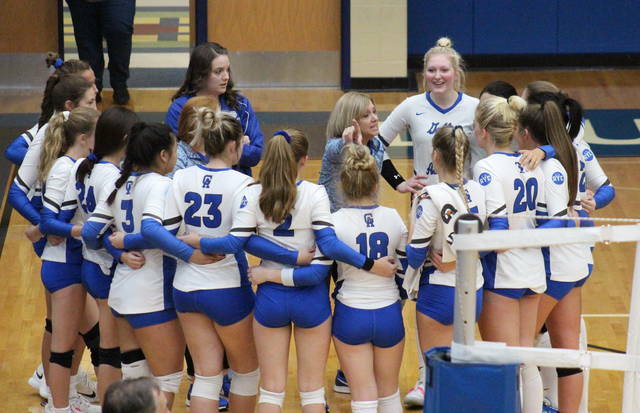 Following the win, fifth-year GAHS head coach Janice Rosier was pleased with how her team preformed, and noted that the Blue Angels are getting close to reaching their potential. Rosier also noted that the Blue Angels will keep doing what they’ve done to reach this point, with their ‘one game at a time’ mentality paying off in the postseason. For the match GAHS had a side-out percentage of 73.7, allowing just 10 service points. The Lady Tigers had a 36.5 side-out percentage, with their match-best of 41.5 coming in Game 2. The Blue Angels recorded a dozen aces, but also had a dozen serving errors, leading to a 83.8 serve percentage. Waverly had just one ace and an 81.6 serve percentage after seven errors. 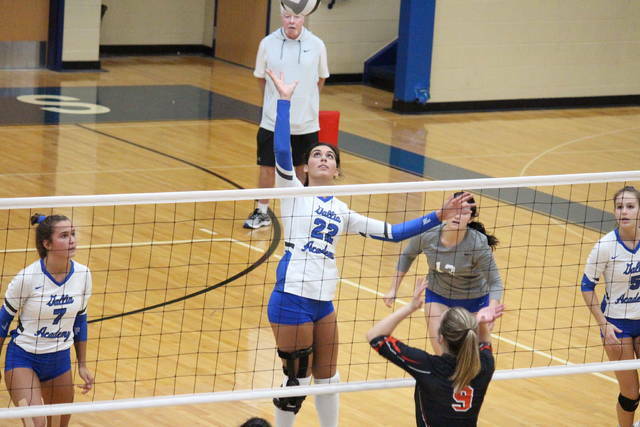 At the net, Gallia Academy’s 37 kills were met with just 11 attacking errors, leading to a 33.8 hitting percentage. WHS had 10 kills, but finished with 14 errors for a sub-zero hitting percentage. 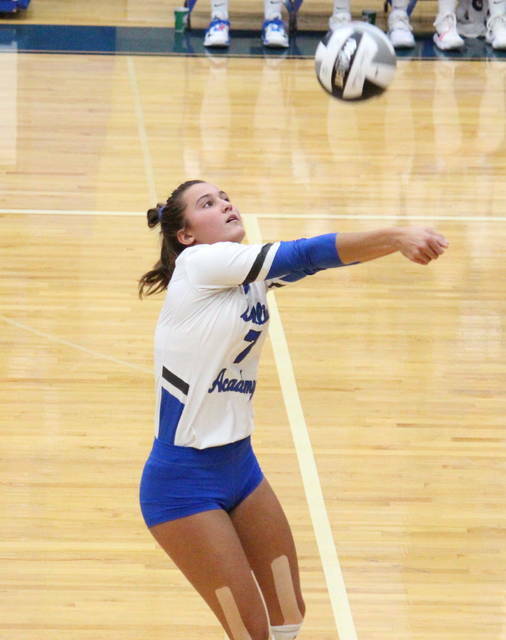 GAHS junior Alex Barnes led the victors with 12 service points, including two aces. Taylor Burnette, Peri Martin and Hunter Copley finished with nine points apiece, including three aces each by Burnette and Martin and two aces by Copley. Martin and Copley both finished with perfect serve percentages in the win. Ashton Webb earned six service points and a pair of aces, while Maddie Wright rounded out the Blue Angel service with two points. Webb led the victors at the net with 18 kills. Maddy Petro was next with seven kills, followed by Barnes with six. Wright picked up five kills and the team’s lone block, while Aubrey Unroe had one kill, and Martin dished out a match-best 35 assists. 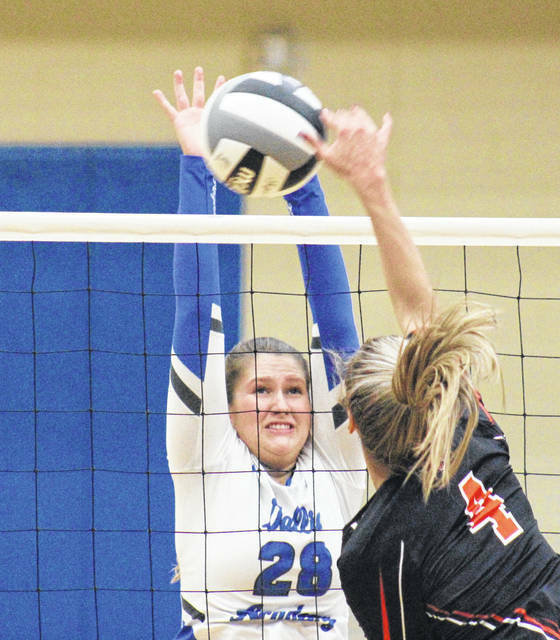 Gallia Academy’s defense — which came up with 30 total digs — was led by Barnes and Burnette with seven digs apiece. Carli Knight and Kami Knight had three points apiece to lead the guests. Kami Sautter finished with two points, while Hailey Robinson and Sarah Thompson had a point apiece, with Robinson earning the team’s only ace. Carli Knight finished with seven of the Lady Tigers’ 10 kills and six of their 22 digs, both team-highs. Mattie Elliott earned a match-best two blocks, while Hailie Silcott picked up a team-high nine assists in the setback. Gallia Academy also ousted Waverly from the 2016 sectional tournament, which is the last time GAHS won both sectional matches in straight games. Next, the Blue Angels will face top-seeded Sheridan in the Wednesday’s district semifinal at Southeastern High School. The Lady Generals were the Muskingum Valley League champions and are headed to their second straight district tournament after a 25-8, 25-7, 25-8 victory over Logan Elm in their sectional final.